Firefighters continue their work on northeastern Alaska fires. July 13, 2017	by PIO Sam Harrel Comments Off on Firefighters continue their work on northeastern Alaska fires. This satellite image from July 12 shows the extent of smoke covering the state from fires burning in Alaska and Canada. 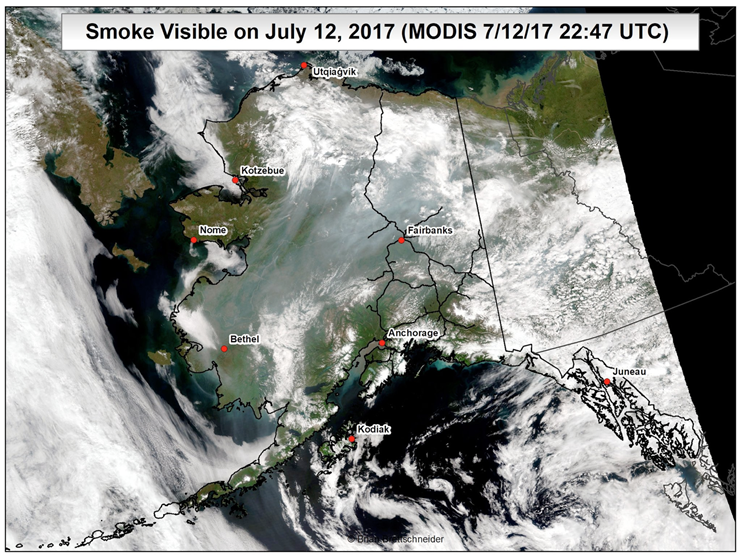 Smoke from fires north of Fort Yukon and in Canada spread across the Interior and south of the Alaska Range the past two days, but also provided a blanket keeping temperatures cooler and relative humidity higher than forecasted on many of these fires in northeastern Alaska. The fires are burning east of the Sheenjek River and along the Canadian border. For a map showing the forecasted extent of smoke over the state click here. There are 28 active fires in the Upper Yukon fire management zone. Most of these fires are burning in remote areas designated for limited protection and are not threatening any sites of value. Despite this, firefighters are assigned to three fires to provide protection to cabins and Native allotments while allowing the remainder of the fires to continue to function in their natural ecological role. Dietrich River (#304) – 357 acres. Start date 7/5/17. Four personnel. The fire received rain with hail in the afternoon. A couple of smokes were visible on the southern end of the fire. BLM Alaska Fire Service (BLM AFS) and Alaska Division of Forestry (DOF) personnel are monitoring the fire burning along the Dalton Highway near Milepost 224. Motorists on the highway are advised to approach the area with caution, keeping an eye out for fire personnel and smoke possibly obscuring the road. Boulder Creek (#292) – 23,384 acres. Start date 7/2/17. 75 personnel. Firefighters are organized into two different groups, both tasked with providing protection to Native allotments and permitted cabins in the area of Vundik Lake and the Sheenjek River. Crews will continue to improve their saw lines and sprinkler set ups as they hold their positions and monitor the fires burning nearby. The fire was most active on the north side of the fire away from the cabins and allotments. The fire is 1.3-miles north of the Vundik Lake cabin, 2.5 miles from the allotment on the lake, and 4-miles from the allotment on the Sheenjek River. The fire received a small amount of precipitation in the afternoon. This fire, along with White Snow Fire (#303) and Helmet Fire (#312), are all within six miles of each other on the east side of the Sheenjek River. They are burning in a limited suppression area in the Arctic National Wildlife Refuge. Campbell River (#268) – 33,100 acres. Start date 6/26/17. 35 personnel. Firefighters continue to improve their saw lines and sprinkler set ups as they prepare to protect Native allotments and permitted cabins in the areas of Salmon Trout, Porcupine, and Campbell rivers. Aerial reconnaissance reported the fire was 20 percent active, smoldering and creeping, with isolated torching in black spruce. The southern portion of the fire made a 5-mile run to the southwest coming within 2.5 miles of the allotment on the Salmon Trout and Porcupine rivers. . Some areas of the fire received a small amount of precipitation in the morning. The fire is burning in a limited protection area within the Arctic National Wildlife Refuge. It started in the Yukon Territory and crossed into Alaska on June 26. The total fire size is estimated to be more than 93,000 acres.